With its excellent sensitivity to various dark matter candidates (WIMPs, axions, ALPs), neutrinos (solar, supernovae, coherent neutrino nucleus, scattering) and other rate processes (neutrinoless double beta decay of 136Xe, double electron capture of 124Xe, etc. ), DARWIN will be an important low-background observatory and a central player in the international particle physics landscape. To stress the importance of the DARWIN science, the collaboration has submitted a document as input to the European Particle Physics Strategy Update 2018-2020. 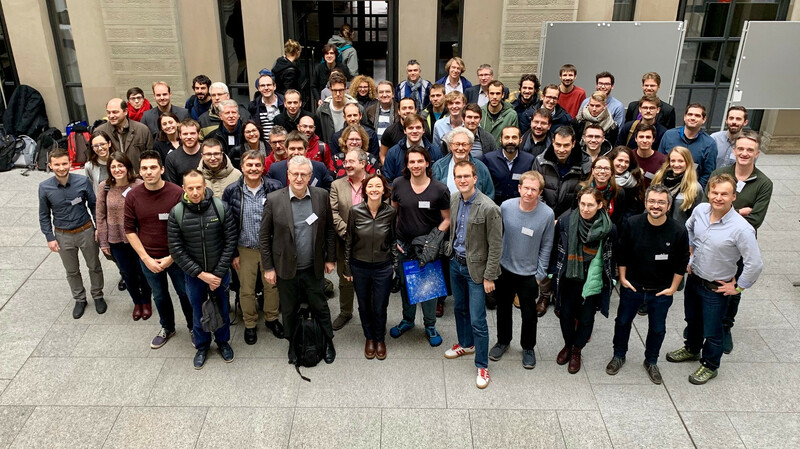 About 70 members of the ever-growing DARWIN collaboration have met at the University of Zurich (Switzerland) to discuss and coordinate their R&D activities towards the ultimate dark matter experiment. A total of 37 contributions focusing on all relevant aspects for DARWIN were presented. The Identification of Dark Matter (IDM) conference series is one of the most important bi-annual meetings of the dark matter community. Its 12th edition in July 2018 was held at Brown University (Providence, USA). The DARWIN project as the ultimate WIMP detector and its rich science program was presented by Fabian Kuger (Freiburg). The slides can be found here. In a recent paper, DARWIN collaborators Jayden Newstead (ASU) and Rafael Lang (Purdue) show that future xenon experiments with a 200 txy exposure (=DARWIN) will be able to detect the flux of CNO-solar neutrinos at 3 sigma signicicance and will thus provide important insight on the metallicity of the Sun's interior. The images from the article show that the CNO components of the neutrino flux (blue, left) are hidden below the much more abundant signal from solar pp- and 7Be neutrinos. However, the CNO spectral shape is different and extends up to MeV-scale electronic recoil. The CNO signal is also buried below the background from 2 neutrino double beta decay (ννββ blue, right), which dominates the electronic background in multi-ton-scale LXe dark matter detectors. To measure the CNO-flux, it is thus mandatory to deplete the LXe target from 36Xe by a factor 100 (dashed blue). J.L. Newstead, L.E. Strigari, R.F. 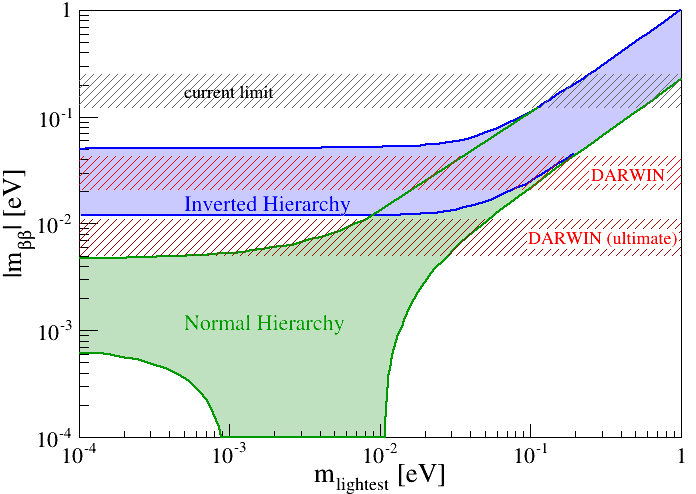 Lang, CNO Solar Neutrinos in Next-Generation Dark Matter Experiments, arXiv:1807.07169. Manfred Lindner (MPIK Heidelberg) presented the DARWIN project at the Dark Matter Conference which takes place every second year in Los Angeles. He emphasized the challenges of a multi-ton liquid xenon detector, especially in terms of backgrounds, and presented promising solutions. The slides of the talk can be found here. The Astroparticle Physics European Consortium (APPEC) has published its strategy for the years 2017-2026. The consortium appreciates the goal of an ultimate dark matter detector as proposed by DARWIN and recomments to converge on a strategy for its realization in the next years. Neutrino physics with DARWIN is the title of an article written by M.L. Benabderrahmane (NYUAD) on behalf of the DARWIN collaboration and which appeared now in the proceedings of the Neutrino 2016 conference. M.L. Benabderrahmane, Journal of Physics: Conf. Series 888, 012048 (2017). More than 40 members of the DARWIN collaboration did meet in Freiburg (Germany) to discuss the next steps of the project. The two days were dedicated to intense discussions on the structure of the collaboration and how its goal of an ultimate dark matter detector is being pushed forward in the upcoming years. At this occasion, the collaboration decided to accept three new groups joining DARWIN: the groups of LPNHE, France (Luca Scotto Lavina), LAL, France (Carla Macolino) and of the University of Heidelberg (Stephanie Hansmann-Menzemer et al.). The season of summer conferences has started in May with the DARWIN project being presented at many of the important astroparticle physics and particle physics events. The German committees for astroparticle physics (KAT), elementary particle physics (KET) and for hadrons and nuclei (KHuK) organized a meeting in Mainz to discuss their common strategy regarding the Future of non-Collider Physics. The final declaration of the workshop (available in German only, pdf) states that DARWIN, with its broad scientific program on neutrinos, should be realized if the future direct detection results are promising. Two members of the DARWIN consortium were awarded prestigious ERC grant from the European Research Council. Marc Schumann (Freiburg) was awarded an ERC Consolidator Grant for his project ULTIMATE in November, and Laura Baudis (Zurich) received an ERC Advanced for her project Xenoscope in March. ULTIMATE will start in May 2017 and Xenoscope in October. Both projects aim at preparing for the conceptual design of DARWIN, by conducting ambitious R&D to solve various technical challenges. The article Testing WIMPs to the limit authored by the DARWIN project coordinator Laura Baudis was published in the CERN Courier. It describes how the multi-ton liquid xenon observatory DARWIN could be realized at the Italian Gran Sasso Laboratory (LNGS) by the mid-2020s and the plethora of science topics in particle and astroparticle physics it can explore. The image illustrates the baseline design of the DARWIN time projection chamber, with two arrays of photomultipliers installed above and below the sensitive liquid xenon target. The scientific article describing the DARWIN facility, its WIMP and non-WIMP science channels, backgrounds and the current status of R&D towards its realitation has now been publcished in the Journal of Cosmology and Astroparticle Physics: DARWIN Collaboration, JCAP 11, 017 (2016), arXiv:1606.07001. The DARWIN group of Marc Schumann is moving from the University of Bern (Switzerland) to the University of Freiburg (Germany). The group plans to extend its DARWIN acitivities at the new institution. Two dedicated talks presented the science opportunities of DARWIN at the TeV Particle Astrophysics Conference (TeVPA), which was held at CERN this year. Alexander Kish (U Zurich, slides) introduced the DARWIN project and described its sensitivity to WIMPs, and also summarized the plethora of new science channels which open up with a multi-ton liquid xenon detector. Shayne Reichard (Purdue, slides) focused on the possibility to detect supernova neutrinos, as studied in a recent publication. The bi-annual IDM conference on the Identification of Dark Matter is one of the largest conferences focussing almost entirely on dark matter, with experimental direct detection covering a large fraction of the agenda. The 2016 edition of the event took place in Sheffield and Auke Pieter Colijn (NIKHEF/U Amsterdam) has presented the science case for DARWIN and the path towards the ultimate dark matter detector. The slides are available here. The DARWIN project has been presented at two summer conferences: Luca Scotto Lavina (Subatech) discussed the project and its science opportunities (slides here) at the Dark Matter 2016 conference in Santander (Spain). The poster presentation of Lotfi Benabderrahmane (NYUAD) at NEUTRINO 2016 in London focused on the new possibilities for neutrino physics which will open up in DARWIN. A new study on the possibility to detect neutrinos emitted in supernova explosions in large-scale liquid xenon TPCs has been published online at arXiv:1606.09243, led by DARWIN members from Purdue and Bologna. The detection process in liquid xenon detectors such as DARWIN is via Z-boson mediated elastic coherent neutrino-nucleus scattering (CNNS). This complements "conventional" detectors for supernova neutrinos, as this process is sensitive to all three neutrino flavors and their anti-particles and therefore allows for the reconstruction of the neutrino-light curve without uncertainties from neutrino oscillation as well as the measurement of the total energy emitted in neutrinos. 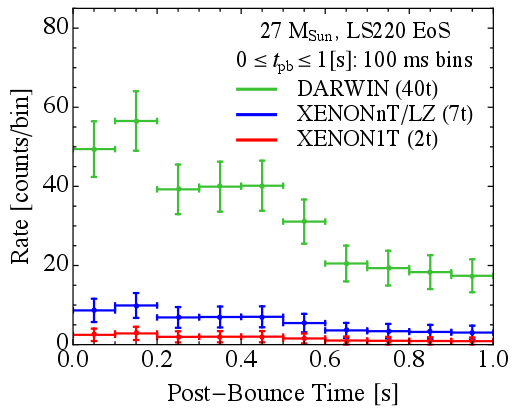 The Figure from the publication shows the expected neutrino rate observed the 40 t liquid xenon target of DARWIN during the first second after the explosion of a supernova of 27 solar masses at a distance of 10 kpc. Thanks to its large target, low background and low energy threshold, DARWIN will observe about 300 neutrinos in the first second, which will allow to trace the emission rate during the supernova neutronization and accretion phases. Today, the DARWIN collaboration has published a detailed article on DARWIN, its science channels, its background and on the R&D towards its realization. The study, signed by 119 authors can be found here: arXiv:1606.07001.
and other rare nuclear processes. The Figure is from the publication and shows the sensitivity of DARWIN to the effective Majorana neutrino mass via a search for the neutrinoless double-beta decay of 136Xe. Two different exposures (30 t x y and 140 t x y) at two different background levels are shown. The 'ultimate' case assumes that background from the detector materials can be removed completely, thus the remaining backgrounds are from 222Rn in the Xe target, 8B solar neutrinos and the two-neutrino double beta decay. DArk matter search WIth liquid xenonN (DARWIN) has been presented at the 12th PATRAS Workshop on Axions, Wimps and Wisps which took place on the island of Jeju (South Korea). Moritz von Sivers (Bern) presented the project and its many search channels. The group of Ethan Brown at the Rensselaer Polynechnic Institute, RPI (Troy, USA) has joined DARWIN. It will strenghen our R&D efforts in terms of the handling and purification of a large-mass gas target. The DARWIN project, its science goals in terms of dark matter and other astroparticle physics channels, and some recent R&D projects have been presented by the DARWIN project coordinator Laura Baudis at the ULCA Dark Matter Conference, which takes place in Los Angeles (USA) every second year. The presentation can be found here. We are happy to welcome three new experimental research groups to the DARWIN consortium. The groups from University of California at San Diego (Kaixuan Ni), the University of Chicago (Luca Grandi) and the New York University at Abu Dhabi (Francesco Arneodo) bring in a broad expertise in experimental rare event searches with noble liquids. The DARWIN colleagues from the University of Münster (group from Christian Weinheimer) inaugurated their new DFG-funded reasearch training group Strong and Weak Interactions - from Hadrons to Dark Matter with a retreat in Telgte (DE) from November 24-26, 2015. The science case for DARWIN -- WIMPs and various other rare processes -- was presented at this occasion. The DARWIN group at the Weizmann Institute of Science (Amos Breskin) has recently published two studies in the Journal of Instrumentation (KINST), demonstrating interesting new approaches for the readout of large-scale LXe TPCs. The first publication describes the first results of a large-area cryogenic gaseous photomultiplier (GPM) coupled to a dual-phase LXe TPC, which might be used to realize a TPC with a 4pi readout. The second article reports on the diect observation of gas bubble-assisted electroluminiscence in LXe; a potential way to realize a single-phase detector with "local dual-phase" amplification. 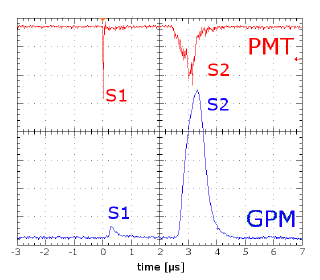 The Figure shows light (S1) and charge (S2) signal from a dual-phase TPC, recoded with a PMT and a GPM. The latter was operated at a gain of 1x105 and the signal is shaped using a timing filter amplifier. The scientific opportunities which open up with a multi ton-scale liquid xenon detector such as DARIN were presented by Marc Schumann (Bern) at the 14th Internatonal Conference on Topics in Astroparticle and Underground Physics (TAUP 2015), which took place in Torino. The talk, which emphasized that the neutrino-floor is accessible with DARWIN, is available here. Intrinsic backgrounds, the ones which cannot be reduced by target fiducialization, are most critical for large-scale dark matter detectors. The question whether the activation of the xenon gas by cosmic rays can lead to problematic backgrounds was investigated in a dedicated study by DARWIN members (arXiv:1507.03792). Several cosmogenic isotopes were identified in a xenon sample which has been activated for one year at an altitude of 3470 m, however, only one of the isotopes (125Sb) can potentially lead to a background for the dark matter search. An ultra-pure sample of copper was exposed to cosmic rays together with the xenon in order to provide a benchmark and to test commonly used codes to calculate the activation. Alfredo D. Ferella (Stockholm) has presented the DARWIN observatory and its science channels at the high energy physics conference of the European Physical Society (EPS HEP 2015), one of the largest topical events in the field, which was held in Vienna this year. The slides can be found here. DARWIN members from Bern, Zurich and Bologna have studied the WIMP dark matter reach of a DARWIN-like multi-ton LXe detector. Taking into account all backgrounds, including the one from solar pp-neutrinos, the DARWIN sensitivity was studied vs. exposure, background rejection, energy threshold as well as energy scale. The authors conclude that spin-independent cross sections as low as 2.5 x 10-49 cm2 for WIMP masses around 40 GeV/c2 can be probed with an exposure of 200 t x y. In addition, DARWIN will also have an excellent sensitivity to spin-dependent couplings (in particular when WIMPs couple to neutrons) as well as to inelastic processes. (Read more: arXiv:1506.08309). The Figures show the sensitivity of DARWIN for two different exposures of 200 t x y (black, with 1 and 2σ bands) and 500 t x y. The left plots shows spin-independent couplings, the right plot spin-dependent couplings to neutrons. The DARWIN sensitivity is compared to already achieved results by XENON100 and LUX, plus the expected sensitivities of upcoming experiments. A talk on the multi-ton stage of the XENON experiment and how to go beyond to the DARWIN scale has been presented at WIN 2015 in Heidelberg by Hardy Simgen (MPIK), with a special emphasis on the various technical challenges which will arise. The talk can be found here. Coordinator Laura Baudis has presented the DARWIN project at a 1-day workshop on the future of LNGS in Assergi, Italy. 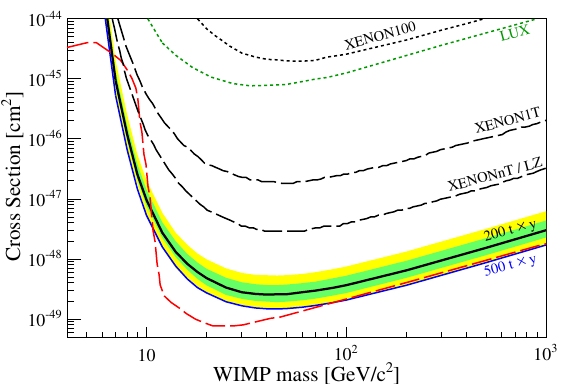 In the DARWIN presentation she made the case that a multi-ton scale dual phase TPC filled with liquid xenon is ideally suited to search for WIMP dark matter for all masses above about 7 GeV/c2, probing spin-independent, spin-dependent as well as inelastic channels, with an appealing complementarity to dark matter searches at colliders. Due to its extremely low background, DARWIN-LXe will be sensitive to various other science channels as well, such as low energy solar neutrinos, axions and axion-like particles, supernova neutrinos, double beta decays, etc. At the same meeting, the argon groups presented their independent program for the LAr future: following a 20t stage of DarkSide, they propose to build Argo, a LAr detector of 300t mass. Due to the excellent background reduction based on pulse-shape discrimination, such a detector would not only search for WIMP dark matter at masses of 1000 GeV/c2 and above, but would also be able to measure 7Be, pep, and CNO neutrinos with high precision, exploiting the energy region above the 39Ar background. More than 35 members of the DARWIN consortium have gathered at the Weizmann Institute of Science in Rehovot (IL) to discuss the status and the future of the project. At the first day, we organized a workshop in order to review the current status of the field in various aspects, which was open to everybody interested and very well attended: up to 100 people followed the presentations. All contributions can be found here. Switzerland is putting together a new roadmap for large infrastructures of national importance. The Swiss DARWIN groups have submitted a proposal to get onto this roadmap. It has been evaluated and has received the highest possible ranking, "A: considerable importance", and a clear statement that it should be included in the roadmap. [24.07.2014] Change of the DARWIN URL: We can now be found even easier! As of July 24, 2014, finding the DARWIN pages in the web is even easier than before. The new address is darwin-observatory.org. Of course the old URL at the University of Zürich remains valid as well. The project coordinator of DARWIN, Laura Baudis (UZH), presented the status of the project at the SWAPS 2014 workshop in Cartigny, close to Geneva (Switzerland). The main topics of the meeting were astroparticle and neutrino physics, and the DARWIN slides can be found online. DARWIN was presented as the ultimate WIMP detector in a review talk on future noble gas experiments. The presentation was given by Patrick Decowski (Nikhef/Amsterdam) at the Latest Results in Dark Matter Searches workshop in Stockholm (Sweden). The DARWIN project was presented by Giuliana Fiorillo (Napoli) at the UCLA Dark Matter 2014 conference, which takes place every second year in Los Angeles (USA). Aiming for the ultimate WIMP detector, the DARWIN talk (slides) was presented in the session covering new very large detectors. The 5th general meeting of the DARWIN consortium took place from December 9-11, 2013, at the University of Naples (Italy). More that 25 members attended the presentations on recent developments to improve low-background noble-liquid TPCs, the science reach of DARWIN-type detectors, and to discuss the future of DARWIN beyond the ASPERA-funded initial period. The link to the presentations can be found on the restricted pages. Members of the DARWIN collaboration, from the University of Zurich, University of Bern, and the MPI für Kernphysik, have shown in a recent publication (arXiv:1309.7024) that a DARWIN-type dark matter detector, filled with about 20 tons of liquid xenon and operated as a dual phase TPC, can not only detect WIMP dark matter with a sensitivity down to spin-independent cross sections of a few 10-49 cm2, but that it can also be used to do neutrino physics. Using a detailed Monte Carlo simulations, and realistic assumptions on background levels and thresholds, they could show that a first real-time measurement of the flux of solar pp-neutrinos is feasible to a precision of ~1% in a 5 years measurement. Other new neutrino physics channels are the neutrinoless double beta-decay of Xe-136, where competitive sensitivities can be reached even without isotopic enrichment, and coherent neutrino-nucleus scattering. 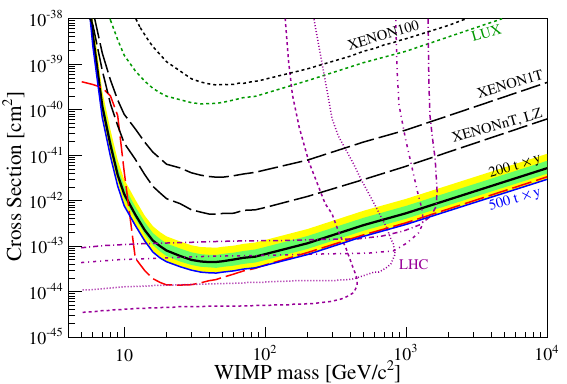 In a new article, arXiv:1306.3244 and PRD 88, 076011 (2013), the DARWIN members of Arizona study the scientific dark matter reach of ton-scale dark matter detectors, such as DARWIN. In their numerical study, they incorporate realistic detector physics, particle physics and astrophysical uncertainties and demonstrate to what extent two targets, senon and argon, with similar sensitivities can remove various degeneracies and allow a determination of dark matter cross sections and masses while also probing rough aspects of the dark matter phase space distribution. The development of a multi-ton scale dark matter facility is an important goal in the Astroparticle Physics Community and is attracting more and more scientists. As of 01.05.2013, two new groups have joined the DARWIN consortium: an independent group from the University of Zurich (Ben Kilminster) and one from the University of Stockholm (Jan Conrad). A popular science article featuring DARWIN has been published on the Aspera website. It summarizes the challenges in direct dark matter detection and for DARWIN, based on an interview with the DARWIN project coordinator Laura Baudis (Zurich). The DARWIN consortium is growing again. Three new groups are joining the international effort to build a multi-ton dark matter detector using a liquid noble gas target. The groups from Imperial College London, UK (Roberto Trotta) and of Purdue University, USA (Rafael Lang) are joining as of December 2012, the group from Bern, Switzerland (Marc Schumann) will start in January 2013. On September 13/14, 2012, more than 30 members of the DARWIN consortium representing the xenon and the argon side of the project met for their annual meeting at the Johannes Gutenberg Universität in Mainz, Germany. It was a opportunity to discuss the status of the project, to present recent research highlights, and to meet new collaborators. All presentations of this meeting can be found here (restricted access). The 4th general meeting of the DARWIN consortium will take place in Mainz September 13/14, 2012. More information on the meeting and registration details for members can be found here. The Patras workshop series continues to attract the key players in the field of direct dark matter detection to gather in a nice and personal atmosphere to discuss recent results and the progress achieved so far. DARWIN was presented in a combined talk with XENON1T, the slides can be found here. A conference proceedings article on the development of GridPix detectors for dark matter searches with noble liquids such as DARWIN has been published in IEEE NS. The Nikhef group working at this subject aims to improve the charge measurement in double phase time projection chambers. Every second year in February, experimentalists and theorists gather at the UCLA Dark Matter conference organized by the University of California at Los Angeles (UCLA) to discuss the progress of the field. DARWIN was presented at this meeting, the slides can be found here. The status of the DARWIN project and highlighs of recent progress was presented at the TAUP 2011 conference in Munich. The proceedings paper of this conference is now available online. The DARWIN consortium is growing once more. The group of Kai Zuber at TU Dresden (Germany) is joining DARWIN with the start of the year 2012. An article to appear in the Proceedings of the 7th Patras workshop on Axions, WIMPs and WISPs is available online now. It gives an overview on the project and on the current status of the R&D activities within the consortium. We are pleased to announce that our working group "Scientific Impact" is getting stronger as the cosmology group of Arizona State University (Lawrence Krauss) is joining the DARWIN consortium. 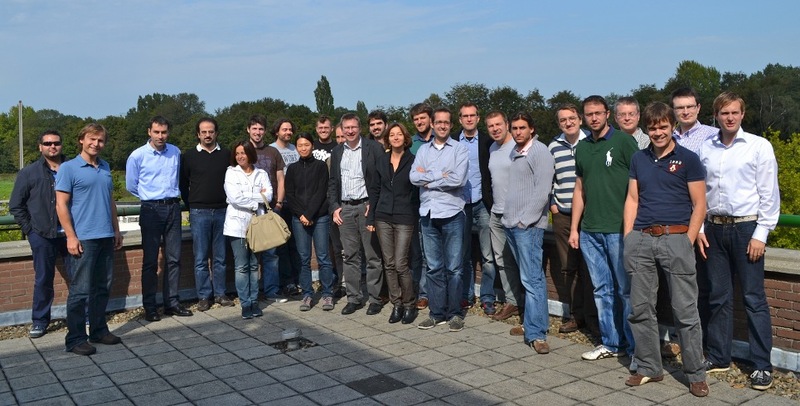 On September 15 and 16, 2011, the third face-to-face meeting of the DARWIN consortium was held at Nikhef in Amsterdam. Many members were attending and presented their research progress on the various topics covered in DARWIN. The bi-annual meeting on Topics in Astroparticle and Underground Physics (TAUP) is one of the most iimportant and biggest meeting for Dark Matter Searches. It's 12th edition was held September 5-9 in Munich, Germany. DARWIN has been presented at this meeting, the presentation can be found here. As announced previously, the third general meeting of the DARWIN consortium will take place at Nikhef in Amsterdam on September 15 and 16, 2011. Information regarding accomodation and transportation can be found in the DARWIN wiki. The DARWIN project has been presented at the 7th Patras Workshop on Axions, WIMPs and WISPs which was taking place end of June on the Greek island Mykonos. We are looking forward to cooperate with the new members. The third general meeting of the DARWIN consortium will take place in Amsterdam on September 15 and 16, 2011. The DARWIN project and its technical requirements were presented at the ASPERA Technology Forum on Photosensors and auxiliary electronics in Munich, Germany. The second meeting of the DARWIN consortium was held on Sept 14-15 at the University Zurich. About 30 scientists came together to report on the progress that has been achieved in the time since the last meeting. More information about this event and the results presented at the meeting (restricted access) can be found here. The second general meeting of the DARWIN consortium will take place at the University of Zurich on September 14-15 2010. The first face-to-face meeting of the full DARWIN consortium was held at the Physik Institut of the University of Zürich on January 25-26, 2010. More than 35 members of the collaboration got together and discussed the DARWIN project in an open and constructive atmosphere. It was a succesful start of the collaboration on its way towards a large scale, liquid noble gas based Dark Matter experiment in Europe. Collaboration members can find more information about this event on the internal pages. We are happy to announce that the DARWIN proposal got approval by the ASPERA network, and that the DARWIN groups from Italy, France, the Netherlands, and Switzerland will be funded to work on this project at a total cost of 633 kEuro. The network says about DARWIN: One of the strengths of this project is that it brings together groups working in the existing Xenon, WArP-140 and ArDM collaborations and unites expertise on liquid noble gas detectors, low-background techniques, cryogenic infrastructures and shielding. Read more on the ASPERA website. The proposal of the DARWIN (Dark Matter Wimp Search With Noble Liquids) collaboration has been submitted to the ASPERA network. ASPERA (AStroParticle ERAnet) is a network of national government agencies responsible for coordinating and funding national research efforts in Astroparticle Physics.